50,000-year-old giant tree honors 9/11 heroes - Jacaranda, Inc. The Tane Mahuta, or Millennial Kauri, is the largest and most recognizable tree in New Zealand. The prehistoric giants grew during the Jurassic period and were felled by an unknown natural disaster as long as 50,000 years ago. Time and sediment accrued until the fallen logs were dug out from meters of mud and debris. The perfectly chemically balanced environment in which they were submerged preserved the timber, and it is as fresh and beautiful as the day the trees came down. The massive logs could be up to 70 meters long and 9 meters in diameter, each one a stunning natural sculpture just waiting to be turned into a rare work of art or a fine piece of wood furniture. The Antico Table is one of those works of art. Renzo and Matteo Piano designed the Antico Table as part of the “Ground Zero Ground Heroes” project. The Riva Family convened several renowned designers to help launch their initiative. They worked with the designers to develop five iconic pieces of wood furniture, which would be sold at a charity auction with the help of Christie’s auction house. The proceeds from each item would then be donated to the children of the Italian-American firefighters who died during the rescue efforts following the attacks. The stunning Antico table represents a bridge from the past to the future, symbolizing rebirth. The table’s decorative iron base is meant to remind users of the wreckage of the Twin Towers. It measures an incredible 6’ by 40’ and provides plenty of space, allowing everyone a seat at the table. The Earth table is another of the Ground Zero Ground Heroes pieces. Also made of the ancient and majestic Tane Mahuta timber, the Earth tabletop consists of wood pieces set in resin, creating an illusion of wood floating above a tubular iron base, representing the collapsed structural supports of the towers. This table was designed to serve as a reminder of the horror of that day and the indomitable human spirit. The rich look and warm feel of natural wood and wood veneer make them the ideal materials to enhance virtually any area. The Riva family has used historic timber to memorialize some of our country’s bravest heroes, with the stately, solid tree demonstrating strength, beauty and lasting durability. Jacaranda, Inc., also taps into these characteristics with every piece of wood it uses. 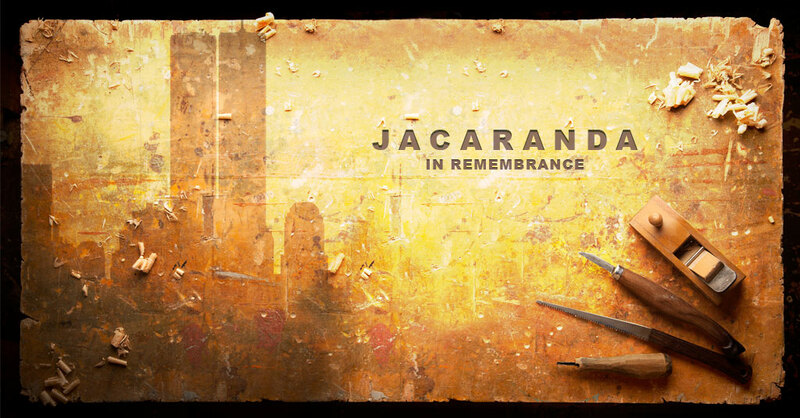 Jacaranda’s natural wood veneer products grace walls, reception desks, cabinets, architectural panels and more. Each piece we use is carefully chosen, cut, and finished to enhance its natural beauty and add value to your space. We offer popular, rare and exotic species as well as recon species with rare burls and figures to create a precise look or feel in any area. Contact us today to find out more.